Recently I was teaching at a local Integrative Pain Clinic and ran up against someone’s overwhelming fear about hypnosis. It has happened before a few times while teaching there, but besides being told that “I was the doing the devil’s work,” she also told me that her pastor said to keep away from doing it. I am not in the business of ‘converting’ anyone, so I just smiled and suggested mildly that she take advantage of learning how to relax because that would help her to learn to cope with her chronic pain issues more effectively. Instead she spent the whole class with her eyes wide open, body rigid in the chair and obviously didn’t learn how to relax. When I returned the next week to teach, I did an open-eye trance project, which she was able to do, accept, and learn from. At the end of that class, she thanked me. I wasn’t expecting that, but it felt nice all the same. 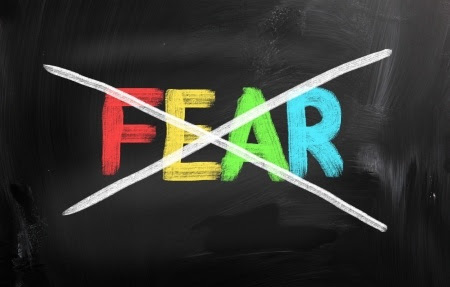 What fears are holding you back from attaining something you want? As for me, I am trying not to over-worry and obsess over problems, but instead look for the excitement I get from solving a problem, learning something new, implementing a change that is more efficient, appreciating when I know exactly what to do, etc. Next time you come up against a wall of fear, consider a session with me to break through it. Sometimes the only way out is through.